I have been creating art since before I was 6 years old, but it wasn't until I attended my first art retreat, over 10 years ago, in Hampton, Virginia, did the artistic life I yearned for suddenly begin. That's when I discovered dreams really do come true...as now, I am living it! My love for metal work and gemstones, have become an ever-constant source of inspiration. When not teaching and designing jewelry, my love for photography, mixed-media art, painting and drawing, constantly keep me preoccupied. I have joyfully been making art, designing jewelry and sharing my love for teaching full time, since retiring from Harris County, and the financial world, in 2010. I have taught classes in Tucson, Arizona, Coronado, California, and Round Top, Texas for Vivi Magoo, Ltd. I also have taught locally, at Spring Beads in Spring, Texas, and yearly at Adorn Me! in Houston, Texas. I have taught nationally at a Work of Heart in San Jose, California, Gilding the Lily in Fullerton, California, Studio Crescendoh in Santa Ana, California, Ephemera Paducah in Paducah, Kentucky and at ArtBLISS in the Washington DC area. I loved teaching online jewelry classes for Artful Gathering, for 4 years, and have 7 DVDs still on sale there today. They can be found HERE. I have been published in Belle Armoire Jewelry, Artful Blogging, Somerset Memories, Jewelry Affaire, Marie, Jewelry the zine. You can also find my work in several books, Bead Soup by Lori Anderson, The Missing Link by Cindy Wimmer, and in a mixed media art competition book published by North Lights, called Incite, Dreams Realized: The Best of Mixed Media. 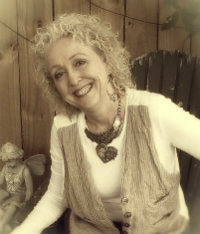 I was also a contributing artist in Kristen Robinson’s eBook, The Romance of Mixed-Media Jewelry, and was honored to be a Guest Curator for Crescendoh.com, sharing my story of how Art Saves, in May 2010. I was thrilled beyond belief, in the Summer of 2017, as Belle Armoire Jewelry featured my torch fired enamel jewelry in their Designer Series. Here. And, the very first time I was published in Belle Armoire Jewelry, my necklace was chosen to be on the cover. That was in the Spring of 2009 HERE. In September of 2018, I entered and was chosen as one of semi-finalists (I was part of the Fashion & Style category) in the first ever, Texas Works Awards, a competition for Texas makers. I was told there were hundreds of participants from throughout Texas. I didn't get chosen as a finalist, or the winner, but it sure was a fun ride! So, now what? I am thrilled to announce that as of January 2018, I have taken the position of Creative Workshop Coordinator and Metals Instructor, at Multipliciy, LLC. I am busy bringing in teachers that travel to teach nationally, not only in the discipline of metals, but all forms of mixed media, as well. I myself continue to teach 1 and 2-day Metalsmith classes at my home base, two minutes away in the Multiplicity Studio, in Katy, Texas. I like to sum up my ever-winding creative path with a quote of mine, "My feet lead me to where my heart has always been". I have never felt that more....deep down inside my soul, as I do so today!